A few years ago I got the brilliant idea that I would start a photo re-touching business. Not retouching glamour shots, and making 110 pound women look like they’re 85, but fixing old photos that had scratches and tears, color shifts or exposure problems. Saving the past for the future. I never did launch my business, but I’ve gotten a lot of practice under my belt in the mean time, and have been bitten by the Photoshop bug ever since. Last Friday I was out minding my own business snapping photos of the sunset on 72nd Street and Central Park West and was taking a short break to buy a GREAT burger from Big Nick’s –the one on 71st NOT the one on Broadway –when my mom called. 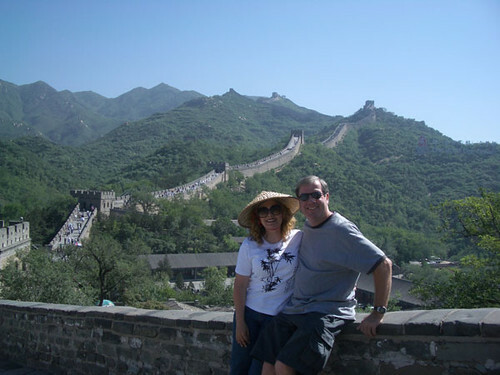 So, my mom and her fiancé, (they’re getting married in August) went on a trip to China a few weeks ago and had a blast. She said that she found the shot they wanted to send out with their engagement announcements and wanted to know if she should put a black or white border around the edge. “You’re going to send it to me first aren’t you?” I said. A long moment ensued, twenty cabs zipped by and joggers aplenty while I listened to her brain click through the reasons why she should send me the photo in the first place. Once she remembered that I’m a little handy with Photoshop, she readily agreed. Promising that she’d email it to me right then. Bad photo. Great potential. Crappy picture taking conditions. The good thing, I could fix it, for the most part. In China, at least in Beijing, one only sees a blue sky every once in a long while. (This is according to my Sister the Expat who lived in China for two years.) 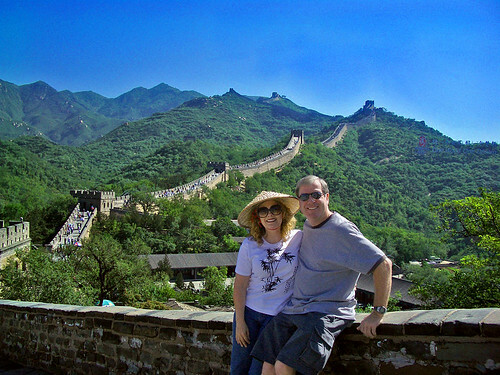 Well, mom and her fiancé were lucky, the only blue sky they saw during their entire trip happened the day they went to see the Great Wall. Things working well in the photo: Blue sky, great framing with the wall in the background. They look happy and relaxed, nice pose. Things not working in their favor: The humidity and the harsh mid-day sun. The sun cast harsh shadows particularly on my mom and her fiancé, and refracted off every particle of water in the air, turning everything in sight a grey and muting all the colors. This is what it looked like when I finished tweaking it. Still not great, but it’ll work. At least you can see their faces, and get an idea at how wonderful the day must have been. The only thing I would question is the artifacting going on in the sky and faces -- a result of the source photo, or final jpg compression perhaps? Yeah, the sky bugs me too, and I didn't take the time to smooth it out. I think the artifacting is a combination between camera quality (hers is 4 megapixal point and shoot at least 3 years old), and the moisture in the air. I did a little smoothing out on their faces, but didn't want to do too much. The picture was VERY noisy while veiwing it at just 100%. There were so many other things I was trying to fix that I let the sky slip, but looking back at it now, I wish I would have smoothed it out. I think it looks fantastic! What a great improvement! I'm sure your mom has an eye more like mine and she will be thrilled!!! She love it, Donna, and thanks!